A worksheet to practice various food (dates, ice cream, cupcake, sandwich, salad, water, honey, nutella, apple). 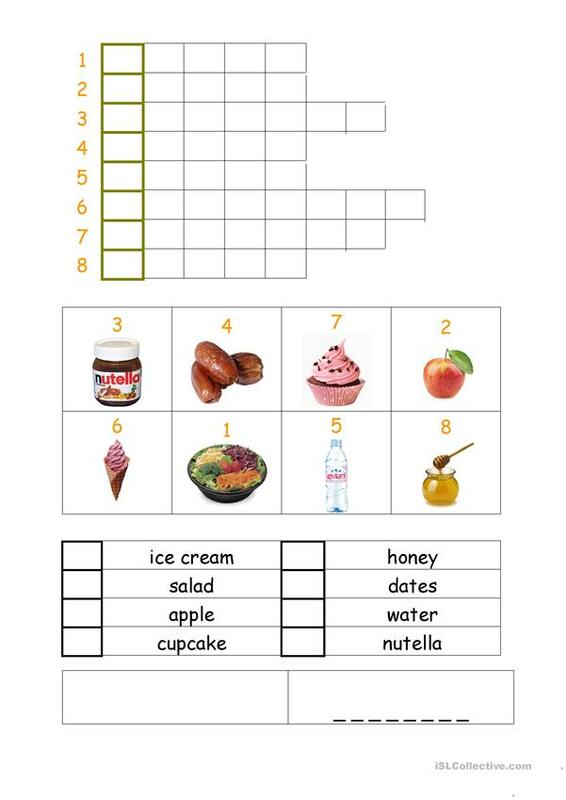 There is an exercise to match the names with the pictures, then students do the crossword, and in the end they write the solution (sandwich) and draw it. The above downloadable teaching material is best suited for elementary school students at Beginner (pre-A1) and Elementary (A1) level. It can be used for developing your students' Spelling skills. It features the topic and words of Food. Eszter22 is from/lives in Hungary and has been a member of iSLCollective since 2010-12-03 20:05:19. Eszter22 last logged in on 2017-05-15 22:50:49, and has shared 7 resources on iSLCollective so far.